Among the muscle cars, station wagons, and pickup trucks offered at Mecum’s Los Angeles sale is this European beauty. Facel Vega’s first cars were the two-door Coupes of the “FV” line. There were three different models, the 1954-1955 FV, the 1956-1958 FVS, and the 1958-1961 HK500. This is an FVS, more specifically an FV4 (the FVS was split between FV3, FV3B, and FV4 models). Most FV4s were powered by a 5.8-liter Chrysler V-8. This FV4 is powered by the 6.3-liter Chrysler “Typhoon” V-8 that makes 360 horsepower. This was the same engine from the mighty Chrysler 300B. This is also the engine that powered most of the later HK500s. Only 36 FVS cars were built with this huge engine – and there were 85 FV4s built in total (1958 was the only year for the FV4). These are highly sought-after cars and this one has had a body-off cosmetic restoration. The interior is brilliant and you could eat off of the engine, it’s that clean. Click here for more info and here for more from Mecum. 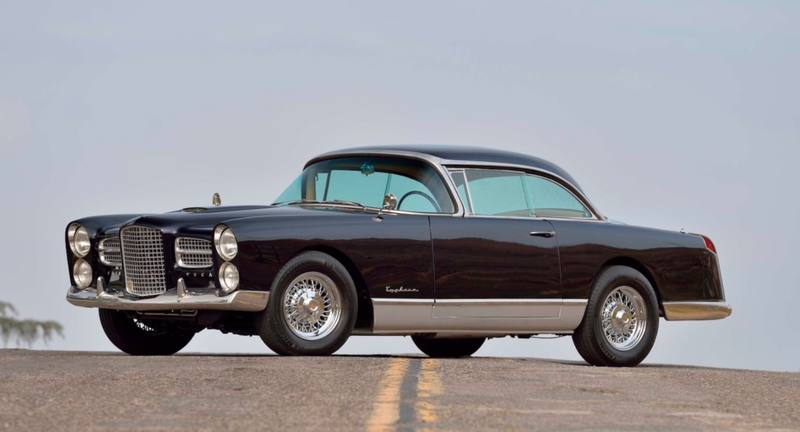 This entry was posted in Uncategorized and tagged 1958, auctions, cars, classic cars, facel vega, fv4, mecum, typhoon by classiccarweekly. Bookmark the permalink.